A nonsensical poem that illustrates rhyme, rhythm, and alliteration. A collection of seven nonsensical riddles written as poems. "Solutions to Puzzles from Wonderland"
A set of seven poems. The author uses the example of two faulty clocks to make a point. A folk tale poem about the trickery of the Walrus and the Carpenter in their hunt of oysters. Carroll, Lewis. Poems, Puzzles, and Stories of Lewis Carroll. Lit2Go Edition. 2012. Web. <https://etc.usf.edu/lit2go/112/poems-puzzles-and-stories-of-lewis-carroll/>. April 20, 2019. 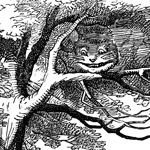 Lewis Carroll, Poems, Puzzles, and Stories of Lewis Carroll, Li2Go edition, (2012), accessed April 20, 2019, https://etc.usf.edu/lit2go/112/poems-puzzles-and-stories-of-lewis-carroll/.